A new year signals the time to think about new enterprises – exploring how, and where, to begin profiting from a “family favorite” recipe. The 2011 Food Safety Modernization Act, and subsequent FDA rules, have made it a bit more challenging (but not impossible) to start a food business, in that even if state regulations allow a food product to be made in an inspected home kitchen (in Pennsylvania, referred to as a “limited food establishment”), when the food goes regional or national, FDA requires that all products be made in a commercial kitchen. 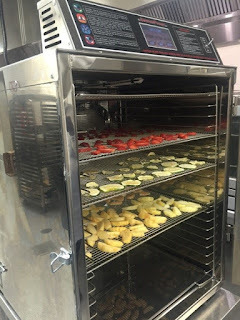 The next step up is a shared kitchen incubator – at which you will not only access commercial equipment and facilities, but also benefit from “supportive services,” that apply to food production and business management. There will be an on-site manager who can help you navigate the complex network of regulation, packaging and distribution to have the best opportunity for a profitable enterprise. Because of the increased level of service, the per-hour rate will probably be higher than that of a shared use kitchen – but depending on the complexity of product and marketplace, this can be money well-spent. You may also determine the need for small-scale co-packing – allowing trained workers who are already familiar with commercial equipment and recipe conversions to make valuable contributions to your venture. One such facility here in Pennsylvania is the “Field to Fork Agricultural Incubator,” which opened its doors at the Greater Johnstown Career and Technology Center in Johnstown Pennsylvania in September 2016. Joining “Field to Fork” not only means accessing the CTC’s commercial kitchen, but allows you to enlist the knowledge and skills of culinary arts students who are working towards their ProStart Certification, and are available to work side by side with kitchen tenants. As with all shared kitchens, “Field to Fork” is focused on specific targeted groups – local value-added producers with smaller crop yields and food entrepreneurs who need a place to start. Products that can be most easily created in this kitchen are non-organic, jarred fruits and vegetables, dried foods, and baked goods. During its pilot phase, use of the kitchen will be available on a first come, first serve basis. Dry storage and cold storage are also available for a monthly fee. In short, shared kitchen incubators do provide the environment necessary for food businesses to start, grow and succeed – by offering not only the right equipment and environment but many services that simplify and economically provide just what is needed in today’s food industry.